2017 Honda Accord Hybrid – Helping The Environment Was Never This Much Fun! If you live in the Inland Empire and have made the decision to move into an environmentally friendly sedan, the 2017 Honda Accord Hybrid in Fontana, CA, at Rock Honda is a car you need to check out. With a sleek, classy exterior married to a spacious and well-appointed interior, this is a car you’ll love to drive—and that helps our environment! Test drive a 2017 Honda Accord Hybrid near San Bernardino, CA, and discover the appeal of this world-class hybrid. With a large selection of models, Rock Honda has 2017 Honda Accord Hybrid inventory near San Bernardino, CA, at amazing prices! You can prepare all your paperwork ahead of time from our easy-to-navigate website and you can even lock in a price from the comfort of your home or office. Rock Honda also has a wide selection of used and certified pre-owned cars as well as a full-service parts and maintenance department. Stop by and check out the many 2017 Honda Accord Hybrid models on our lot and take one for a test drive! Streamline bodylines accented with sculpted side panels, flared fenders and 17-inch alloy wheels give the 2017 Honda Accord Hybrid a stylish, sophisticated appearance. Wraparound available LED headlights/daytime running lights flank a curved grille emblazoned with the famous H logo. 8 vivid colors, tasteful chrome accents and a special trunk area Hybrid badging between bright LED taillights add touches of refinement. In the cabin of the 2017 Honda Accord Hybrid you’ll find spacious seating for five, a space-age cockpit, a leather-wrapped steering wheel with mounted controls, comfy front bucket seats with available leather trim/heating and available driver memory. And when it comes to technology, the 2017 Honda Accord Hybrid features Honda Sensing™, a multi-angle rearview camera, available Honda LaneWatch™ and available Honda Satellite-Linked Navigation System with 7-inch display. With Bluetooth®, you’ll enjoy your phone, available Pandora®, SiriusXM® Radio and HD Radio through the available 360-watt 7-speaker premium audio system. When you think about it, you actually get two power sources with a hybrid like the 2017 Honda Accord Hybrid! This incredibly fuel-efficient car utilizes a 16-valve DOHC i-VTEC® in-line 4-cylinder engine paired with an E-CVT automatic transmission with Sport Mode that cranks out 143 horsepower and 129 lb.-ft. of torque. When the AC synchronous permanent-magnet electric motor kicks in, you’ll enjoy 181 horsepower and a surprising 232 lb.-ft. of torque. With MacPherson strut front, multi-link rear suspension along with electric power-assisted rack-and-pinion steering, you’ll always feel confident driving near San Bernardino or near Rancho Cucamonga, CA. 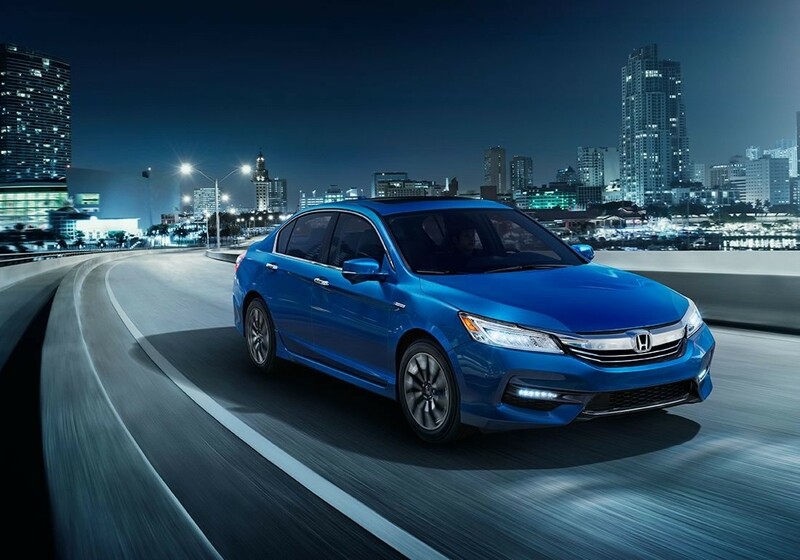 Come see Rock Honda in Fontana, CA, and test drive the very cool 2017 Honda Accord Hybrid. Find out for yourself how much fun helping the environment can be!